Amina´s daily work is to create pottery to be used in hotels and in private homes. For decoration, cooking utensils or other purposes. Soap holder, wash basins, pots, lamp shades etc. The clay in use is from Makunduchi, the classic red African clay, that Amina pulls up in the traditional Zanzibari way shaping it with only her hands. After the clay has dried it burns for a few hours in a fire made of coconut wood and coconut scraps. At a workshop with Jambiani Women pottery you sit down and work together creating something of your own with Amina as your teacher. 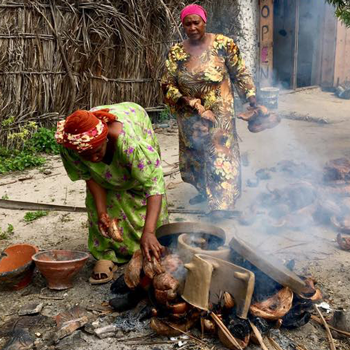 This pottery workshop is a unique way to gain insight in the life on Zanzibar, and to create an opportunity to come close to the women. Even though Amina talks only Swahili the friendly atmosphere, happiness and will to communicate will make it possible to understand each other. Incl clay, spice tea and a gift from the Pottery Shop.